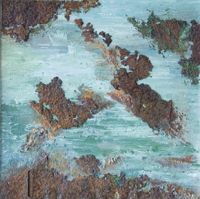 My material paintings are mixed media paintings using various objects and materials in combination with acrylic paint. Natural earthly colors and materials like iron, leather, wood or sand form the basis of most of my paintings. The background structure is often based on acrylic paint, modelling paste and sand. Details structures are made with sand and (natural) pigments. Volvanic landscapes and deserts are a source of inspiration for my art work. In some paintings I use symbolism as main subject. I'm a member of the artclub in Eindhoven. It is an association of artists which have a basis in the Zeelsterstraat 147 in Eindhoven. Regular expositions and workshops form an inspiring and informal environment to meet other artists.